Giota our guide to the Acropolis and walking tour was great. She engaged with everyone and even with the young children. Her knowledge of Athens and Greek history kept us enthralled and she even gave us bits of Grecian gossip along the way. She obviously enjoys her job. We would highly recommend this tour, it is worth the price. However we were not impressed with the second tour, the guide to Cape Sounion was so boring that several people fell asleep during her commentary. And the Temple was just another Temple. 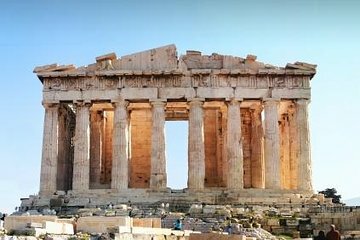 We gave a very good score because of the Acropolis walking tour. Both the Acropolis Walking Tour + afternoon tour to Cape Sounion were perfectly organized, the guide was very friendly and competent to answer any questions of the participants. She gave comprehensive information on both tours. 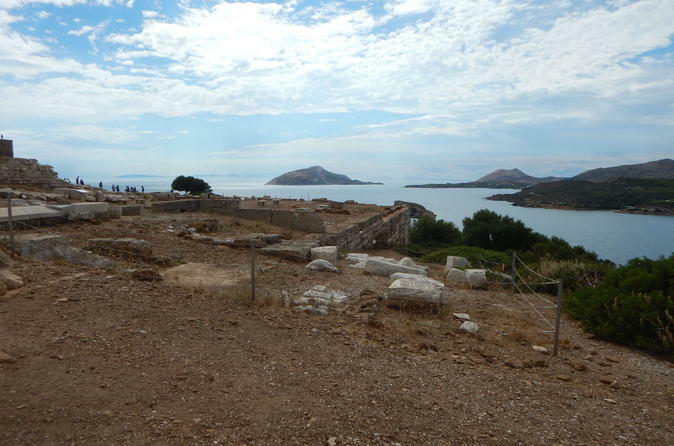 Both the walking tour and the half day to Poseidon are a must do while you are in Athens. Informative, just long enough, great views and knowledgeable guides. A perfect day. 1st part: Our walking tour was replaced with the bus tour due to the weather... We were offered to prepay €10 per person for the tickets to the Acropolis and €15 per person for the museum... We did. Well, the Acropolis entrance did cost €10 per person, however museum was only €4... And we did not spend much time there - we just kind of ran through and was not given the opportunity to explore on our own. Tour guide was nice and knowledgeable. When we got back to the tour provider I asked why we were charged almost 4 times more for the tickets and the reply was to cover tour guide time (?!)... Also we completely missed the guard change ceremony and were told to go and see it ourself... No water were provided on the tour (just an FYI)... And after this part of the tour we were told to go and find something to eat and be back in 50 minute for the second part of the tour...2nd part: Trip to the Cape Sunion:When we got back to the tour operator we boarded the bus and a different tour guide joined us. It took us around 1.5 hours to get there. And maybe 30 (?!) minutes there... as there are not much to see in that location: small historical side with the ruins of one building and 10 minutes of comments from the tour guide and a few pictures and nice view on the sea and... nothing else. We definitely expected MUCH MORE! Spending 3 hours in the bus in order to see almost nothing for 30 minutes in my opinion is complete waist. I should have done a better research... Oh, well. They should call this a "Half Day Napping Tour" because we spent more time napping on the bus than learning or seeing anything. We were definitely disappointed. This was a fun filled day of learning Greek history and seeing important sights both in Athens and south of Athens. The guides were very informative and I learned a lot about what happened here thousands of years ago. I am not sure which part I enjoyed best as both were great! This was the perfect way to visit the Acropolis and understand what you’re looking at. Our guide was very knowledgeable and spoke excellent English. We went in October and the sun was hot and it’s a lot of walking and climbing so being in good shape, wearing a hat and taking water are important. It was a great way to see all of the main sites which gave us time to explore on our own the next few days! Worth the day to see two of the three major sites - the Temple of Poseidon and the Parthenon. The walking tour was great. Our guide was informative and open to any questions us tourists had. The National Garden was okay. Not much to see there. It doesn't look well kept, but it was nice to walk in the shade for a bit. The highlight of the walking tour for me was the Acropolis. Our guide provided information on all the structures before leaving us to wander on our own. For the Cape Sounion and Temple of Poseidon half-day trip, the ride to Cape Sounion was absolutely beautiful. The drive takes you along the coast and the views are unbelievable. Cape Sounion is breathtaking. It was very windy, but gorgeous. My only negative with this trip was the tour guide, unfortunately. I regrettably can't remember her name, but it must be said that it was extremely difficult to understand her. Her heavy accent and the manner in which she spoke made any chance of absorbing any historical facts a wash. However, the views made up for it. Great tour! The staff was very helpful and the tour guide was very knowledgeable of all things Athens, Greece, and Mythology.